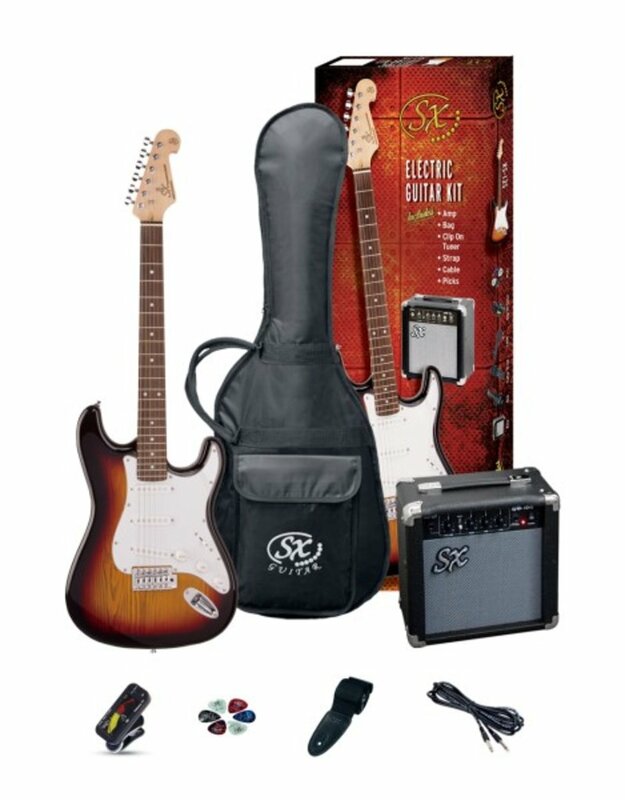 These excellent beginner packs from SX guitars include everything you need to get rocking! ESSEX PACKAGE - ¾ size. Essex 3 Tone Sunburst ¾ size guitar. Solid basswood body. Select Canadian maple neck with 2 way truss rod. Rosewood fingerboard. 21 frets. 3 single coil pickups. 1 volume and 2 tone controls. 5 way switch. 3 ply white scratchplate. Chrome diecast machine heads and vintage tremolo bridge. SX 10 watt amplifier with 5" speaker; volume, bass and treble controls. Drive switch and headphone socket. 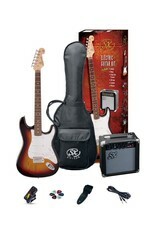 Plus: SX clip-on tuner/metronome, gig bag, strap, picks, lead and UPlay Guitar Guide with free online lessons.